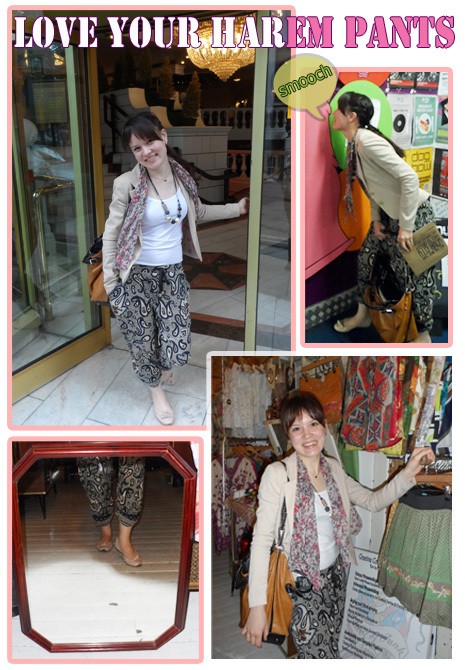 Dressing up: Rock your harem pants! – Go ask Alisa – DIY capsule wardrobe one stitch at a time! Dressing up: Rock your harem pants! I would never think until I tried it: harem pants do look good with casual jackets. Got these African print pants from River Island like a month ago and I still can not get enough of the look. On the top I have a cream/beige colored jacket – not too casual, not too official. Shoes – my lovely pair of Carvela. Brighten up the look with some handmade jewelery and funky scarf, by the way also handmade. All in all, no matter how hot or cold is your summer – you can always find something to live it to the fullest! Next Next post: Catching up: Raise THE shot glass!